ATLANTIC CITY, N.J. -- Miss North Dakota, a 23-year-old who said President Donald Trump was wrong to pull the United States out of the Paris climate accord, was named Miss America 2018 Sunday night in Atlantic City. Cara Mund topped a field of 51 contestants to win the crowd in the New Jersey seaside resort, where most of the 97 Miss Americas have been selected. In one of her onstage interviews, Mund said Trump, a Republican, was wrong to withdraw the U.S. from the climate accord aimed at reducing greenhouse gas emissions that contribute to global warming. "It's a bad decision," she said. "There is evidence that climate change is existing and we need to be at that table." In an interview with The Associated Press before preliminary competition began, Mund, who lives in Bismarck, North Dakota, said her goal is to be the first woman elected governor of her state. She said she wants to see more women elected to all levels of government. "It's important to have a woman's perspective," Mund, who had an internship in the U.S. Senate, told the AP. "In health care and on reproductive rights, it's predominantly men making those decisions." The first runner up was Miss Missouri Jennifer Davis; second runner up was Miss New Jersey Kaitlyn Schoeffel; third runner up was Miss District of Columbia Briana Kinsey, and fourth runner up was Miss Texas Margana Wood. Earlier Sunday, as a deadly hurricane was slamming her home state, Miss Florida Sara Zeng sent a message of support to those in harm's way - and was then eliminated from the competition. As judges were narrowing the field of 51 contestants (each state plus the District of Columbia), they interviewed Zeng, a 22-year-old from Palm Coast, Florida, who noted that her family is safe. But she expressed concern and support for friends and strangers endangered by Hurricane Irma, which was tearing its way up the Florida gulf coast on Sunday. "I'm thinking about everyone in Florida every single day, but I know that regardless what happens, we'll all get through this together," Zeng said. Shortly after her speech, judges read the names of the remaining Top 15 finalists, which did not include her. Earlier in the week, Miss Texas Margana Wood gave a shout-out to her flooded hometown, Houston; she won Wednesday night's swimsuit preliminary. Zeng won Friday's swimsuit prelim, and promised she'd be part of the post-Irma cleanup and recovery effort, whether as Miss America or not. The competition took place at Atlantic City's Boardwalk Hall, where it originated as a way to extend summer tourism to the weekend after Labor Day. 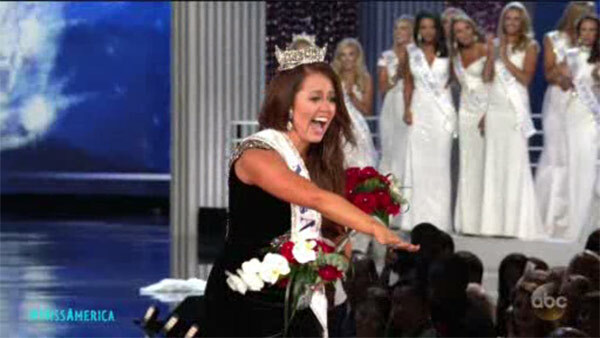 They were vying to succeed the outgoing Miss America Savvy Shields, who won the title last September as Miss Arkansas.